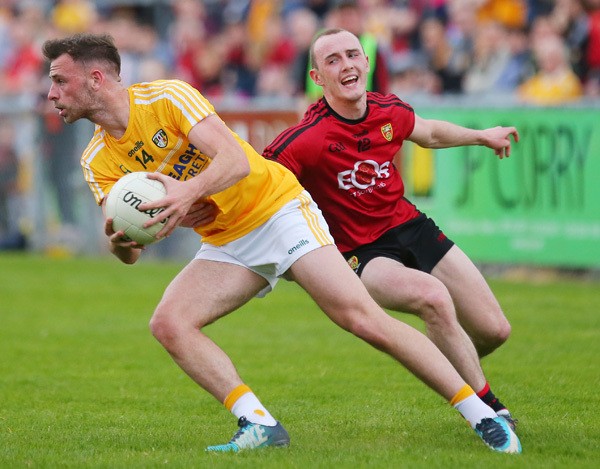 ANTRIM have missed out on a home draw after been pitted against Offaly in the first round of the All-Ireland Senior Football Championship Qualifiers following this morning’s draw. The Saffrons were beaten 1-18 to 0-14 by Down at Newry’s Pairc Esler on Saturday night. Down’s Kevin McKernan bagged a goal just before the break to give the Mournemen a 1-9 to 0-5 advantage. Despite a much-improved performance from Antrim in the second half, they were never able to get back on terms with their hosts and finished the game with 14 men following Ricky Johnston’s straight red card late on. The Creggan defender will miss the trip to O’Connor Park, Tullamore on Saturday, June 9 as Antrim seek to bounce back against the Faithful County. Although Antrim were beaten by Offaly at the Midlands venue last year when the sides met in Division Three of the Allianz Football League, Offaly’s recent five-point defeat by Wicklow in the Leinster Championship will give Antrim hope and manager Lenny Harbinson insists he will have no problem lifting his team’s morale following Saturday night’s Ulster Championship exit. Speaking after the full-time whistle at Pairc Esler, Harbinson remarked: “We’re looking forward to the draw and I just said to panel in the changing rooms, Carlow last year, who got promoted from Division Four, embraced the back door and although they might have lost against Dublin and Monaghan, we’re trying to build a bit of momentum. “I’m disappointed to lose by seven points and I’m disappointed from the aspect that I know the determination and the commitment and effort these lads have put in over the last six or seven months. “It didn’t really reflect itself on the first half performance so, from that perspective, I’m disappointed. “Tactically, we were trying to keep the game tight so we were trying to play a certain way and then to concede a goal a few minutes before half-time, it meant the course of the game was going to take a different shape in the second half.